Now that we’ve covered some of the smaller household bulbs (A-shape, MR shape, Globes, and Chandeliers), it’s time to move on to larger bulbs. BR and R-shaped bulbs are directional light bulbs, focusing their light outward. The most common uses for both shapes are flood lights, track lighting, or in recessed can lights. The type and size of your bulb can be determined by the shape code, made up of 1-3 letters followed by a number. A standalone “R” stands for reflector, which is a mirror-like coating located on the inside of the bulb’s glass housing, boosting the light output. BR bulbs are descendants of the R-shape bulb and therefore very similar in shape. However, the “Bulged Reflector” bulb (abbreviated as “BR”) includes an extra reflector in the neck of the bulb to better capture and cast light forward which was previously lost in the neck and sides of the standard R bulb. This extra reflector in the BR bulb creates a “bulge” just before the socket base begins. BR bulbs are used for everything from floodlights like the BR40 or IR heat lamps like the BR38. Most BR bulbs have bulging neck with the exception of LEDs and CFL bulbs like this BR20. Once you know whether your bulb is an R-shape or a BR-shape, then the numerical part of the shape code represents the widest part of the bulb measured in eighths of an inch. If you divide the number in the shape code by 8, the resulting answer is the diameter of your bulb in inches. The following chart covers the most common BR and R shapes and their respective diameters. After you figure out the correct size, be sure to have the correct voltage rating to avoid the bulb shorting out before buying a replacement for your fixtures. BR and R shape bulbs typically function between 120 to 130 volts. Where Can I Use BR Shape and R Shape Bulbs? Essentially, BR and R shape bulbs are directional flood lights, meaning the light is dispersed across a fairly wide area. The light has a softer edge than a PAR lamp (to be covered later) and the common beam angle is 120 degrees for both shapes. You are more likely to find a slightly narrower beam angle for the smaller, R20 and BR20 bulbs, while R30 and BR30 bulbs could be either broadly designated as spot or flood lights. With such a large beam angle, BR and R shape bulbs do well in situations requiring wall washing or wall grazing, as track lights for large areas or artwork, or providing general ambient lighting via recessed can lights. If you need a long-necked bulb for a deeply recessed can, you can consider using the little-known ER30 or “Elliptical Reflector” bulb for your fixtures. 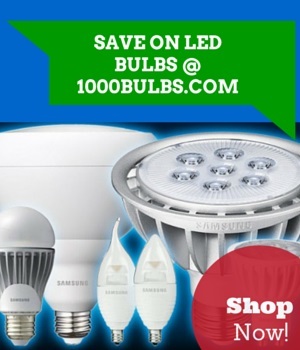 BR and R shape bulbs exist as incandescent, CFL, or LED light sources. Due to the heat sink design and the already directional nature of LEDs, LED BR and R shapes are more of an aesthetic choice than a functional necessity. Know some fun facts about BR or R shape bulbs? Did you know BR bulb abbreviated spells “BRB” or “Be right back”? Do you have a theory about why BR bulbs are always leaving? Write your comments, suggestions, or questions in the area below. Find tips, news, and jokes on our Facebook, Twitter, Google Plus, LinkedIn, or Pinterest. The 1000Bulbs staff sadly announces that, despite many hours of testing, light bulbs do not work as Lures to catch the ever-elusive Pikachu and his electricity-loving friends. On the plus side, at least you will be able to see the game.